For Some Ready To Buy, A Good Home Is Hard To Find Housing season seems to have arrived early in some places where homebuying is already frenzied, and in many markets, the pendulum has swung from an excess of homes on the market a few years ago to a shortage. 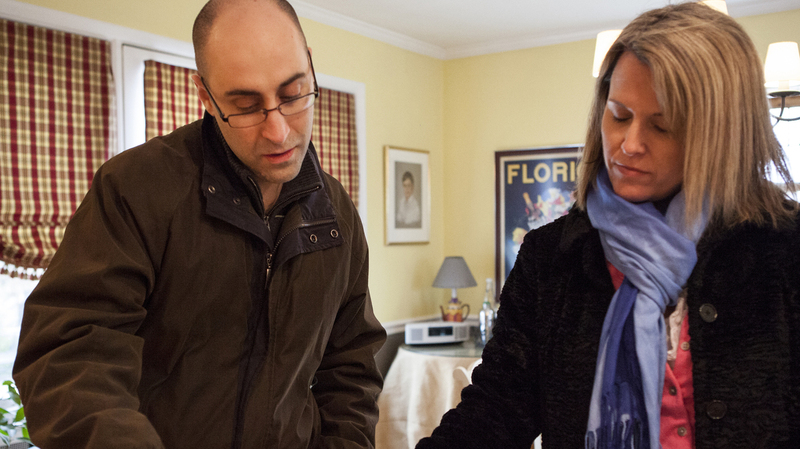 Patrick Bove, a homebuyer (and seller), and Redfin real estate agent Lynn Ikle look at a pamphlet at an open house in Towson, Md. The first day of spring typically signals the high season for open houses and home sales. The season seems to have arrived early in some places where homebuying is already frenzied, and in many markets, the pendulum has swung from an excess of homes on the market a few years ago to a shortage. In Baltimore, Patrick and Britney Bove are fighting on two fronts, so to speak. On one hand, they're hosting an open house in the city's Hamilton neighborhood, and on the other, they're trying to find a house to buy. This is proving difficult, much harder than it was last summer when they casually sampled the market. "There seemed to be a lot more houses on the market," Patrick Bove says. "Everywhere we looked, every weekend, there was something cool. Now that we're finally looking, that's when the shortage has hit." There's a kind of mad quality to their search, and it's made worse by alerts they get to their phones from realty website Redfin every time a new listing posts. They'll even check them in the middle of the night, to the point, Patrick Bove says, where he sometimes doesn't recognize himself. 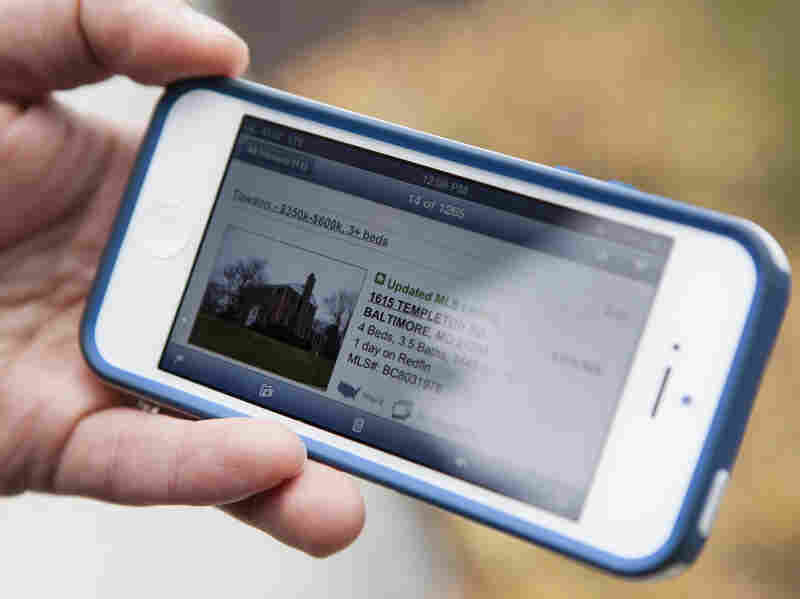 Bove gets text alerts of new homes coming on the market. "The other day I was out shopping and I got an alert and I couldn't get Internet access in there, so I kind of started panicking," he says. "I left all my stuff in the store and just went out the car. If I wait, it could sell. Sure enough that house sold in two or three days. It's completely changed the rhythm of my life." With so few homes on the market, he feels he's on constant alert. A notification he receives in the morning can already be off the market by the end of the day. Rochelle Walker, the real estate agent helping the Boves sell their home, says that mood has permeated the whole market. "I, for example, had scheduled five showings for yesterday, and when I called to confirm, three of them were gone," Walker says. "And that was in a 48-hour period. People are literally making offers inside the homes, because they know homes aren't sitting." Baltimore is far from being the hottest market in the country. In areas like San Francisco; Los Angeles; Austin, Texas; Seattle; and Washington, D.C., inventory is extremely low. But even in Baltimore, and specifically in the Towson area where the Boves really want to buy, inventory is down 47 percent from last year. This is not all good news. Part of the reason few houses are going up for sale is that about a fifth of all homes in the U.S. — as well as in Baltimore — are underwater, meaning the loan is bigger than what the house is worth. So a sizable number of homeowners can't afford to sell. Also, with few recent comparable sales, agents say some offers are falling through because the appraisal comes in below the sale price. With few options to choose from, Patrick Bove recently decided to check out an open house adjacent to his desired neighborhood. The open house was bustling as Bove and his agent, Lynn Ikle, ogled the expansive backyard and the mudroom. Ikle surveyed the room knowing that the house will be gone in day or two, she says. It's not uncommon for her clients to submit offers at 2 a.m.
"There's a panic feeling out there," she says. "It's like McDonald's. They want to just order it, go around to the next window and pick it up." Outside, Bove barely left the house before he paused to call and update his wife. "I want to tell you about the house I just saw. ... It's pretty nice. I think you should come see it," he says. Britney Bove loved the house and they made an offer, but they were outbid and they don't yet have an offer on their own house. "Ah well," Patrick wrote in an email. "The search continues."